Laser fluorescence (LF) (Fig. 6) is less widely known and used by dental professionals, though it constitutes a necessary complement to the traditional methods. LF therefore deserves a more detailed description in this Chapter. Fluorescence occurs as a result of the interaction between electromagnetic radiation and tissue molecules. When light falls upon the surface of the tooth it penetrates a few millimeters into the tissue, and is reflected towards the tip of a device that measures the fluorescence by means of an electronic system. Two incremental ranges are observed in the fluorescence spectrum: one at 430-450 nm, related to demineralization of the tooth, and another at 590-650 nm, related to the presence of bacteria and their metabolites (Lundberg et al., 2007). Furthermore, there are other elements of organic and inorganic origin that can emit additional fluorescence and thus lead to error in the detection of caries: fluorosis, hypomineralization, bacterial plaque, calculus, proximal surface caries and other stains. The origin of the fluorescence is not fully clear (Pretty & Maupome, 2004; Tran^us et al., 2005), though it seems unlikely that apatite is responsible for the basal values associated with normal (healthy) enamel (Hibst et al., 2001). The explanation may be the result of the combination of the inorganic matrix with the absorption of organic molecules (Hibst & Paulus, 1999). During the formation of caries an increase in fluorescence is observed related to two processes: demineralization of the tooth, and bacteria with their metabolic products (porphyrin) (Pretty & Maupome, 2004; Tran^us et al., 2005). Most of the fluorescence is induced by the organic components (Tran^us et al., 2005; Hibst et al., 2001), rather than by crystal disintegration and transmission through scantly homogeneous enamel (Farah et al., 2008). This hypothesis is based on the fact that LF does not detect lesions caused in the laboratory with acids not produced as a result of bacterial activity (Pretty & Maupome, 2004). However, LF is able to detect early enamel lesions with a fluorescent stain (porphyrin TMPyP) (Mendes et al., 2006). The results of the first in vitro studies with LF were promising, with high sensitivity and good reproducibility (Lussi et al., 1999). For dentin caries, many investigations have recorded sensitivity values in a very narrow range close to the highest values on the scale (0.79 - 1.0) (Bader & Shugars, 2004; Lussi et al., 1999). Few studies (Bader & Shugars, 2004) have described very low sensitivity (0.19 and 0.26) - such findings being attributable to subjectiveness and errors in the measurement technique during rotation of the instrument tip (Bader & Shugars, 2004; Reis et al., 2006). Although most studies report high sensitivity, the associated specificity is varied. The specificity values of LF in reference to dentin caries in permanent teeth ranges from 0.50 to 1.0 (Lussi et al., 2001; Pretty & Maupome, 2004; Bas„eren & Gokalp, 2003). Several studies (Bamzahim et al., 2002, 2000; Pereira et al., 2001) have reported near-perfect specificity for LF, thanks to the selection of those teeth with the highest LF readings (Bamzahim et al., 2002), while other authors explain the situation in terms of low sensitivity of the technique (Pereira et al., 2001). In the case of enamel caries the results are contradictory, with either moderate sensitivity ratings associated to high specificity values, or high sensitivity with moderate specificity (Table 4). High sensitivity is in agreement with the observations of previous in vivo studies, though without validation based on fissurotomy (Anttonen et al., 2003; Lussi & Francescut, 2003). The above considerations are also consistent with other studies involving histological validation and measurement of third molars (Reis et al., 2006), and with in vitro investigations involving third molars stored at -20°C (Lussi & Hellwig, 2006). In our study (Abalos et al., 2011), high sensitivity was accompanied by limited specificity (0.63) which, although coinciding with the findings of other authors (Bader & Shugars, 2004; Reis et al., 2006) is lower than in others studies (Lussi et al., 2000; Baspren & Gokalp, 2003; Anttonen et al., 2003; Lussi & Hellwig, 2006). Low specificity could be partially due to the fact that we did not eliminate teeth with the presence of brown or dark spots on fissures from the study sample. This low specificity at D1 level (healthy/ enamel caries) is less important than at D3 level (enamel caries/dentin caries), where the proportion of false-positive readings can have negative consequences, since it can lead to over-treatment. Table 4 summarizes the results of some representative studies in relation to sensitivity and specificity, though for reasons that will be addressed below, the findings of our investigations (Abalos et al., 2009; 2011) may actually be closest to the true situation. Table 4. Sensitivity and specificity of laser fluorescence in the diagnosis of occlusal non-cavitated caries. Most studies evaluating LF have been carried out in vitro (Tran^us et al., 2005; Stookey & Gonzalez-Cabezas, 2001; Hibst et al., 2001; Bader & Shugars, 2004; Lussi et al., 1999), though there are also a number of in vivo studies (Anttonen et al., 2003; Angnes et al., 2005; Heinrich-Weltzien et al., 2003; Lussi et al., 2001; Reis et al., 2006; Abalos et al., 2009; Abalos et al., 2011). The results of in vitro studies cannot be extrapolated to in vivo conditions, and the limitations of these studies are know. The way in which the teeth are preserved, or the changes in their organic content after extraction, are the main factors inducing alterations in dental tissue fluorescence. 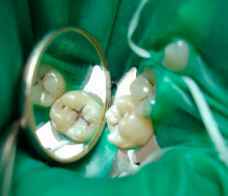 The mentioned organic matrix begins to degrade in the second week of preservation of the tooth. When teeth are preserved in formalin, thymol or chlorine (Francescut et al., 2006), the fluorescence value in the occlusal surface decreases rapidly in the first 5 months (Lussi & Francescut, 2003). This in turn implies a drop in the LF values (Lussi et al., 1999) and favors the obtainment of high specificity results. On the other hand, in vitro studies make no mention of the age and origin of the samples. In vivo studies also pose limitations; in effect, in order to ensure total sample validation, these studies are made in third molars or premolars selected for extraction due to surgical or orthodontic indications. The occlusal anatomy in this case differs from that of the permanent first and second premolars, as a result of which the results must be viewed with caution (Heinrich-Weltzien et al., 2003). In the case of in vivo studies conducted in permanent first and second molars, the teeth presumed to be healthy or with enamel caries cannot be validated due to ethical reasons. The authors must assume the standard, without being able to confirm or discard the presence of caries via fissurotomy. As a result, it is not possible to detect the existence of false-negative readings, which are frequent in the visual inspection-based diagnostic procedure used for sample selection. 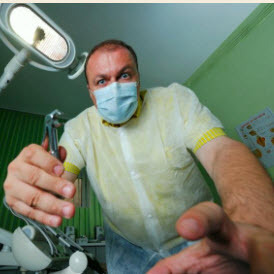 Two options are available in this situation: elimination of the non-validated teeth, whereby the prevalence will be almost 100%, or assumption of the possible existence of false-negative readings in the gold standard. In both cases, the calculations are not precise, and the results must be examined with caution - as pointed out in the literature (Lussi et al., 2001; Heinrich-Weltzien et al., 2003). Only our in vivo studies (Abalos et al., 2009; 2011; Guerrero, 2011) involve permanent first and second molars with total sample validation, since the category of healthy teeth or teeth with enamel caries could be validated. The molars were to serve as abutments for fixed prostheses, and could be validated via fissurotomy before being worked upon. An alternative for the use of an imperfect reference standard method is mathematical correction of the values of sensitivity and specificity (Brenner, 1996). This adjustment could approximate the performance obtained in the studies to the actual performance of the methods, increasing the external validity of the study. This procedure has been employed by Matos (2011) for the first time in studies of caries detection. Another alternative to in vivo evaluations is the conduction of in vitro studies, but with frozen teeth (Lussi & Hellwig, 2006), which allows clinical extrapolation of the results. Other limitations in LF studies are represented by plaque or organic material remains, stains, the degree of tooth dehydration, composite fillings or traces of polishing paste - all of which can affect the LF readings, since they are sources of fluorescence and can therefore give rise to false-positive results. In addition, other factors (Abalos & Jiménez-Planas, 2011) inherent to the tooth such as age, the degree of maturation, and the depth of the pits can influence the measurements obtained (Lundberg et al., 2007). The variation in LF readings found by our group is considerable (Abalos et al., 2009; 2011), in the same way as in other clinical studies (Anttonen et al., 2003; Lussi et al., 2001). However, the mean values show a gradient through the different categories of lesion extent (D0: healthy; D1+2: enamel caries; D3+4: dentin caries) that increases as caries progresses (Lussi et al., 2001). This gradient is observed in both in vitro (Basaren & Gokalp, 2003) and in in vivo studies (Astvaldsdottir et al., 2004; Anttonen et al., 2003; Heinrich-Weltzien et al., 2003; Lussi et al., 2001; Heinrich-Weltzien et al., 2002), and in both permanent teeth (Astvaldsdottir et al., 2004; Heinrich-Weltzien et al., 2003; Lussi et al., 2001; Heinrich-Weltzien et al., 2002) and temporary teeth (Anttonen et al., 2003; Lussi & Francescut, 2003) -though the values are lower in the case of the primary dentition. In our investigations (Abalos et al., 2009; 2011) LF was seen to be able to distinguish between enamel caries and dentin caries (Abalos et al., 2009), though without being able to discriminate between healthy teeth and teeth with enamel caries (Abalos et al., 2011). The explanation for this latter observation is that the initial enamel lesion does not induce a significant increase in fluorescence when compared with healthy enamel. Likewise, Lussi in 1999 (Lussi et al., 1999) reported that LF does not seem very adequate for detecting minor changes in the enamel. Some studies (Astvaldsdottir et al., 2004) have reported a weak correlation between the LF readings and the depth of the lesion, though this does not suffice to view LF as a method for determining depth. In other words, while LF appears to be able to establish when lesions invade one tissue or other, it is not useful for discriminating depth within one same tissue, whether enamel or dentin (Lussi et al., 2001; Basaren & Gokalp, 2003). At present, the cutoff values are based on those established by Lussi in 2001 in the context of a clinical study (Lussi et al., 2001), with standardization as follows: 0-13 for healthy teeth, 1420 for enamel caries, and >20 for dentin caries. The results of our group are in concordance with these cutoff values (Abalos et al., 2009; 2011), in the same way as in other clinical studies . Our values (Abalos et al., 2011) for healthy first and second molars assessed in vivo range between 0 and 14. Values below 10 in all cases corresponded to healthy fissures. The only previous studies (Baspren & Gokalp, 2003; Sheehy et al., 2001) made to determine the limits in healthy enamel have been conducted in vitro (Basteren & Gokalp, 2003) or in vivo in third molars (Sheehy et al., 2001), with histological validation. Laser fluorescence readings of >14 in turn can be indicative of enamel caries, while readings of > 20 can mean dentin caries, though without necessarily implying operative intervention. As advised by Lussi (Lussi et al., 2001), in patients with low caries risk, fissure aperture should be indicated at LF readings of > 30. In contrast to the previously examined techniques, LF is more sensitive than specific, and so implies a greater number of false-positive readings. These readings are normally explained by fluorescence sources unrelated to caries - stained fissures being the main problem facing diagnosis with LF (Angnes et al., 2005; Heinrich-Weltzien et al., 2003) (Fig. 7). The stains contribute an added fluorescence signal that increases the measurement values obtained (Cortes et al., 2003) by between 5-7 units (Heinrich-Weltzien et al., 2003; Sheehy et al., 2001), and represent a frequent cause of overestimation (Sheehy et al., 2001) and of lessened performance of the test. This must be taken into account in order to adjust or modify the cutoff value. When conducting their studies, investigators must specify the percentage of stained fissures in order to allow improved comparison of the results. In our studies (Abalos et al., 2009; 2011; Guerrero 2011) the percentage was approximately 25%. Cases of underestimation are rare, and any such situations are attributable to a poor measurement technique and failure to have rotated the instrument tip in all directions. Fig. 7. Stained fissure complicating laser fluorescence (LF) diagnosis. Receiver operating characteristic (ROC) curves take sensitivity and specificity into account for all the cutoff points, thereby reflecting the global diagnostic capacity of the technique. This analysis also offers the average validity of the method used. Taking Az to represent the area under the ROC curve, Az = 1 would represent perfect diagnostic accuracy. In general, a value of Az > 0.80 is regarded as acceptable, and would mean that the probability of effectively identifying caries is 80%. ROC analysis shows LF to be a good diagnostic technique in application to enamel caries, with Az = 0.803 (Abalos et al., 2011). These results are somewhat inferior to those reported by other investigators (Stookey & Gonzalez-Cabezas, 2001). For dentin caries Az = 0.85, reflecting good diagnostic reliability. These findings coincide with those of some in vivo investigations (Heinrich-Weltzien et al., 2003), but exceed the values of 0.64-0.69 described by other in vivo/ in vitro studies (Angnes et al., 2005), with histological validation in reference to third molars. Comparison of the different diagnostic tests can be based on their respective sensitivity and specificity performances, which reflect the comparative reliability of each technique. The NPV value for occlusal dentin caries was 87%, with a PPV value of 79%. The concepts of sensitivity and specificity therefore allow us to assess the validity of a given diagnostic test. Both sensitivity and specificity offer information on the probability of obtaining a concrete result or reading (positive or negative), according to the true condition of the patient in relation to the disease. However, when a patient is subjected to a test, the dentist lacks prior information on the true diagnosis, and the question is actually posed from a reverse perspective: in the event of a positive or negative test result, what is the probability that the patient is actually ill or healthy? Thus, the predictive values complement the information provided by sensitivity and specificity. The results obtained reflect a high NPV and an acceptable PPV. Therefore, LF is a complement to those tests offering high specificity and a high PPV. LF is a coadjuvant to VI, and the use of both techniques combined increases the number of correctly diagnosed lesions.